Given that I arrived on the 4th of July and people were trying to enjoy their holiday, I was patient about breaking Grandma free from the French Prairie, but after the weekend I started working on formulating her escape. It was hard to know how to go about this; they would only give vague answers to my question of how long she would be there. I pushed a little harder after the weekend and the physical therapist scheduled a home visit so they could assess the safety of her home. Grandma came along and the PT made her go through the motions of how she moves around the house. In the end, I had to remove her shower door and replace it with a curtain, buy six wall grab bars, 2 toilet seat grab bars, a hand held shower, and a shower bench. I had to go to five stores to get everything. It took me two days to acquire and install them (mostly because I had to figure out how to install the grab bars where there were no studs. How have I managed so long without knowing this??). Grandma came home a week and a day after I arrived. I will admit: the more time I spent with Grandma at the French Prairie the more I could see how intense her needs were and the more nervous I got about bringing her home. But I also knew, despite the care she was getting, it was not a healthy place to be and she was definitely not happy or thriving there. In addition, Martha's outbursts were increasing and it was clear that her mental acuity was not intact. On the last day at the Prairie Martha was yelling, "Hello? Hello? Hello? Can anybody hear me? I know they're in the kitchen but I don't know why they won't answer me. If you don't answer me in the next 20 minutes I'm calling the police!" She had the phone in her hand. She was also swearing at the nurses and doctor's and wanting her own escape, but it was clear she was not in any shape to be on her own. 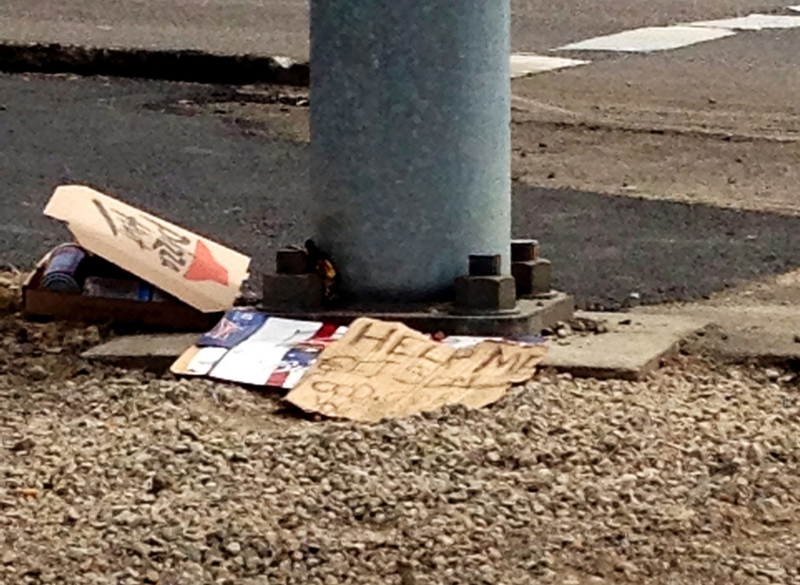 A sign (and garbage) left by a homeless man at the intersection of I-5 and 214.